People who play wargames and microgames are few enough that you may not be able to find opponents locally. The internet has proved a great way to communicate with people all aroud the world, and to bring together widely separated people with common interests. It is only natural to seek wargame opponents on the net. After all, people have been playing chess by mail for years; playing games by E-mail can only be faster, since (barring certain specific ISPs and mail hosts) E-mail arrives within seconds or minutes, rather than the days it takes standard mail to arrive. You could send your moves back and forth entirely by text. Indicate which pieces are moving, and to which board positions (either by hex number, or by assigning a grid to the board). Players at either end could each keep a board with the current game configuration. However, things are much more convenient if you have a virtual game board on your computer, and can send the actual board across E-mail to your opponent. That way, they can immediately look and see where the pieces are; they don't have to interpret a lot of moves and numbers. Also, there is no danger of a mistaken or dropped move meaning that the two players have their boards out of sync. In principle, you could use a paint or draw program, sending the graphic files back and forth (assuming you could agree on a format). However, those data files tend to be large, and it is a waste of bandwidth and space to send these huge image files back and forth when really the information needed is much more compact (i.e. the positions of some tends of counters on a board). Programs like JV_Map provide the missing link. They give you a game board, and the ability to move counters back on the game board. The moves in the game are sent back and forth as very small text files. Because they're plain text, every E-mail reader can handle them (although many still find it convenient to send the files as attachments). Send your normal communication back and forth in E-mail, just as if you were talking. When somebody needs to look at the board to make a decision, whoever last moved the counters around can send a copy of the board state (this small text file) to the other person. When I first started getting into microgames in the last couple of years, naturally I looked for a way of playing them via E-mail. I found that there were several free and commercial programs for Windows out there that served this function, but none for Linux (my OS of choice). Being a programmer, I resolved to write my own. I decided to write it in Java, so that in principle the program would work anywhere Java does. (This means that I would also incidentally be providing a PBEM Wargame aid for Mac users in addition to Unix users such as myself.) Fortunately, Todd Zircher got wind of my project soon, and convinced me to make the program compatable with his V_Map. The compatability between the two programs effectively provides a wider audience for JV_Map. 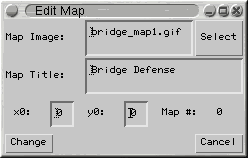 I didn't have to convince other people to install Java on their machines; if they had windows, they could use V_Map while I used JV_Map. When I first started writing JV_Map, there wasn't a stable Java 1.2 availble for Linux. Although there is now, MacOS 9 still only supports Java 1.1. Although I'd love to use Swing and some of the other features of the Java 2 platform, I will strive to keep JV_Map compatable with Java 1.1 as long as Java 2 is not widely availble on the Mac. Note that JV_Map will not run within a browser. It is not a Java applet, it's a full Java application. As such, to use it, you need a Java runtime environment on our machine. Written in Java 1.1 for compatability with Linux, Solaris, Windows 95/98, Windows NT, MacOS, and perhaps other platforms. 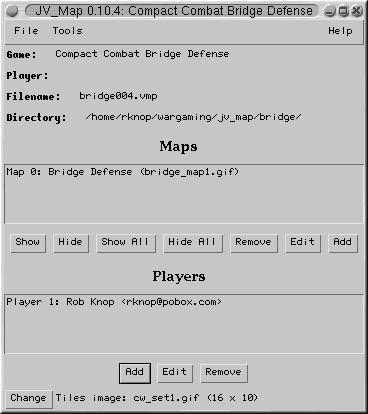 Reads and writes files compatable with V_Map (the Windows wargame PBEM aid by Todd Zircher). State files describing the game board are small plain text files easily sent over E-mail. Supports the VMP 1.5 file format for compatability with older versions of JV_Map and V_Map. A built-in die roller is capable of mailing the die results to all players in the game. Notice the 0 at the beginning of the version number.... There are some things that I mean for JV_Map to support, but which it doesn't yet. Doesn't supprort the LINE, RULER, DICE, or TABLE tags of the VMP 2.0 spec. They will be preserved from one save file to the next, but no lines or rulers indicated in the file will be rendered on the JV_Map screen, and the preset dice configurations won't be used. Write a related application that will allow you to play a wargame with an opponent over the net in real time, rather than via E-mail. Java has strong networking support, so it shouldn't be too hard to write an applacation where, with both opponents running it and connected to the web, the moves made by either player can be shown in real time or near-real time. (To be written. In the mean time, see the JV_Map installation web page. The main JV_Map window shows information about the current game that the program is running, and gives you the controls for loading, saving, and setting up the game. At the top of the main JV_Map window (beneath the menu bar) is some general information about the game running. The name of the game. This is just a title, which is for your convenience. It will be saved with VMP 2.0 files, but will not be saved in VMP 1.5 files. Depending on your Java implementation, the game name may also appear in the title bar of your window. The filename of the last VMP file to which this game was saved, or from which this game was loaded. The directory where the filename is located. This is only important because the image files (the image for the maps and counter set) must be in the same directory as a VMP file for the program to be able to find them when it loads that file. This is a list of maps in the current game. When you first load a game, all of these maps will be displayed. If you close a map window, the map doesn't dissapear; it is just hidden. You can reshow it by clicking on either the "Show All" button, or by selecting that map from the list and clicking on the "Show" button. Most of the rest of the buttons are self-explanitory. With this window, you can change the image, title, and other parameters of the map. For the image, you can load a GIF, JPEG, or BMP image. (If your opponent is using V_Map, you should use BMP images.) The image must be in the same directory as the VMP file; otherwise, if you later try to load the VMP file into JV_Map, it won't be able to find the images. The x0 and y0 parameters specify the position of the top left corner of the map, in pixels. (I think it's top left!) These are not used internally by the program at all, but may be useful for you to keep track of which maps are positioned relative to which other maps in games where you have multiple maps that lay next to each other. Future versions of JV_Map may use this information. If you are adding a new map, you will also have the opportunity to specify the number of this map. Usually the default will be fine. Map numbers must be unique within a game. This is a list of the players in the game. The e-mail address appears in angle brackets. Player 0 is a special player: this is the GM of the game. If your game does not have a GM, then there should be no player 0. At the moment, JV_Map doesn't do much with the players. In the future, it will keep track of the players, will allow for player passwords, will have the option of only letting players move their own counters, and may even have encrypted counters so that only the player may see the "real" value of his own counters. This window's function is pretty obvious. If you select "Add" rather than "Edit", you will also have a wiget in which to indicate the player's number. Usually the default is fine. Player numbers must be unique within a game. At the very bottom of the main JV_Map window is the image name for the tiles set (or counter set), and an indication of the number of counters in the set (columns x rows). To add or chnage a counter set, click the "Change" button. Close the current running game file and start a new game. All maps, counters, etc. in the current game will be lost. You will be prompted for a directory and a filename for the new game. At this point, nothing is actually written to this file; it will simply be the default filename when you later try to save the game. The directory must be the same directory as where you plan to load your map and tiles images from. Load a VMP file. Indicate the VMP file in the file selector. All images referenced by this file must be in the same directory. You can load VMP 1.5 files and the newer VMP 2.0 files; the program automatically detects the difference. Write a VMP 1.5 file. This will only work if your game has only one map. The names of the players, the map titles, and the game title will be lost, as the VMP 1.5 file format spec doesn't support those options. This is the format to use if you are trying to communicate with somebody running an older version of JV_Map or V_Map. Write a VMP 2.0 file. Versions of JV_Map before 0.10.x will not be able to read this file. As of this writing, no version of V_Map supports the VMP 2.0 file, but it is expected that V_Map will support the format soon. Quit JV_Map and the Java virtual machine. You will be presented with a dialog box in which you can give a title to the game. See the JV_Map Dice chapter for more information. This is where the main action happens. The map window has the map image, with scroll bars that let you move around the image. Sitting on the map are the counters of the game. You can add counters, remove counters, exchange counters, and, of course, move counters. It's real easy. Just move the mouse pointer over the counter you want to move. Press and hold the left mouse button. Drag the counter to where you want it to go. Release the left mouse button. Please avoid use of the cupholder on your computer during this operation. Use the "standard popup trigger" on your machine while the pointer is over a counter to get a list of actions you can perform on that counter. On Linux, this means press and hold the right mouse button. I have no idea what this means on other systems; it's a Java thing. Because I don't want to count on every system having a "standard popup trigger," you can also get the popup menu by holding down the shift key while pressing and holding the left mouse button. You will probably never use this. When you select it, the counter is tied to the mouse pointer. Move the mouse to where you want the thing to go, and click the left button to put it down. It's probably easier to just drag the counters around without using this menu item. In JV_Map and V_Map, it's standard to assume that the even numbered counters (i.e. the 2nd, 4th, 6th, etc. on each row) are the backs of the odd numbered counters. In some counter sets, this will not be the case. However, for instance, with the Ogre/GEV counter set, every other counter is a disabled version of the counter to the left. This menu item just flips back and forth between the two ajacent counters, meaning that it's just a "flip" for those counter sets where the even counters are the backs of the odd counters. This is how you exchange a counter for a different counter. You will be presented with a window showing all the counters in the tiles set for the game. Click on the one that you wish to replace the counter whose popup menu you opened, or click "Cancel" to keep the current counter. Move this counter on top of all of the other counters. Remove the counter from the board. Deleted counters are gone for good; however, you can always add a new counter of the same type. The counter comment of a deleted counter will be lost. At the bottom of the popup menu is either the text "(Add Comment)" or the comment for this counter. Select this item to edit the comment. This is just a text string associated with the counter. Use it to store the name of the counter, or notes about the counter, or just ignore it if you don't care. To add a counter, hold down the shift key and the left mouse button (or use the "standard popup trigger" for your platform, e.g. the right mouse button on Linux) over a blank area of the map. (By blank, I mean where there are no counters. JV_Map just displays an image, it doesn't know anything about terrian or other features on the map itself.) You will get a popup menu with a handful of choices, one of which is "Add Counter". Select that, and a window opens with all of the counter images for the current game. Click on the desired counter image, and a counter with that image will be added to the map at the position where your mouse was when you opened the popup menu. You can have multiple counters with the same image; JV_Map does not keep track of the number of counters of each type in a given counter set. It's up to you to make sure you aren't adding more counters of a given type than is allowed by the game's rules. It may from time to time happen that the map image gets screwed up. Usually, this indicates a bug in JV_Map, although it just might be a bug in Java. If things are looking screwy, from the popup menu you can get off of the map (as opposed to off of the counters), there is "Redraw" option that should fix things. I've noted, for instance, that if you try to run JV_Map with Kaffe, the map isn't drawn when its window is first opened; a quick Redraw fixes that. 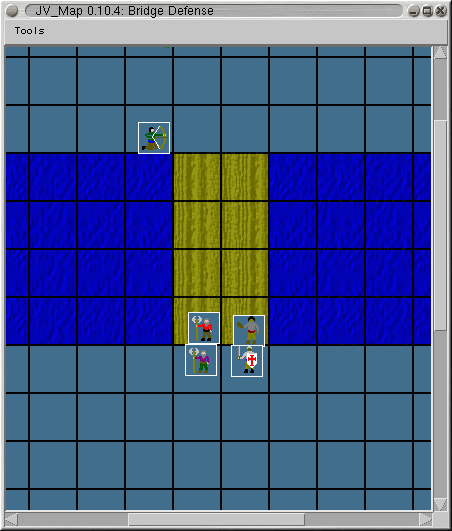 Also, some earlier versions of JV_Map suffered from dissapearing counters. If you scrolled the window around, sometimes when a region of the map scrolled onto the screen the counters there wouldn't be displayed. I think this bug is gone, but if you see it, or if you are just worried, a quick Redraw fixes the problem. JV_Map has a built in die roller which is capable of generating random numbers that simulate the rolls of all sorts of dice. It can E-mail the results of these rolls to all the players (or to anybody else). This way, you don't have to believe your opponent when he tells you what the rolls were; JV_Map can send him a copy of the rolls at the same time you see them. Because it's far too easy to cheat. Yeah, because it E-mails the rolls out, you can't just keep rerolling until you get something you like. Your opponent will see all of the rerolls. However, think about it: if you want to cheat, all you have to do is write an E-mail message that looks exactly like the message that JV_Map sends. OK, you say, why don't you just embed some sort of PGP signature into the messages, so you can be sure that the program generated the numbers? In that case, all that one has to do to cheat is to modify the program's generation of the numbers to generate the numbers it wants. If the key is embedded and capable of signing random output, it will still sign whatever output a hacked version of the program will write. The only really good way to roll dice in PBEM wargames is to use an authenticated third-party dice server such as the one at PBM.com or Irony Games. These will send E-mail to all recepients, and what's more are signed with a PGP key you can use to verify that the mail came from where it claimed to come from. Because you don't have access to that key, you can't put a signature on bad rolls, as you would be able to if the key were embedded in a program such as JV_Map running on your computer. This window lets you roll handfulls of dice multiple times. Dice/Roll: the number of dice to be summed together for one roll. If you want to roll 3d6, make this 3. Sides/Die: the number of sides on a die. If you want to roll 3d6, make this 6. If you select the "E-mail roll results?" checkbox, then JV_Map will attempt to mail the exact text of the results to the people you indicate. This is your outgoing mail server. Give it the same name that you gave to your mail client when you set that up. You can avoid typing this every time by creating a file ".jvmaprc" in your home directory and adding a line "rknop.jvmap.smtpserver=servername" to that file. The port on which your SMTP server is running mail services. This will almost always be 25. You can configure it by setting "rknop.jvmap.smtpport=port" in your .jvmaprc file. This is whom the E-mail messages sent by JV_Map will appear to be from. You can configure this by setting "rknop.jvmap.email=email" in your .jvmaprc file. Recepients must be standard E-mail addresses; normal names with e-mail addresses in angle brackets won't work. Each recipient address must be on its own line.